This week we have a guest feature on the blog. We work with Lewisham Homes to promote recycling and last week visited Hazel Grove in Sydenham to speak to residents about it. 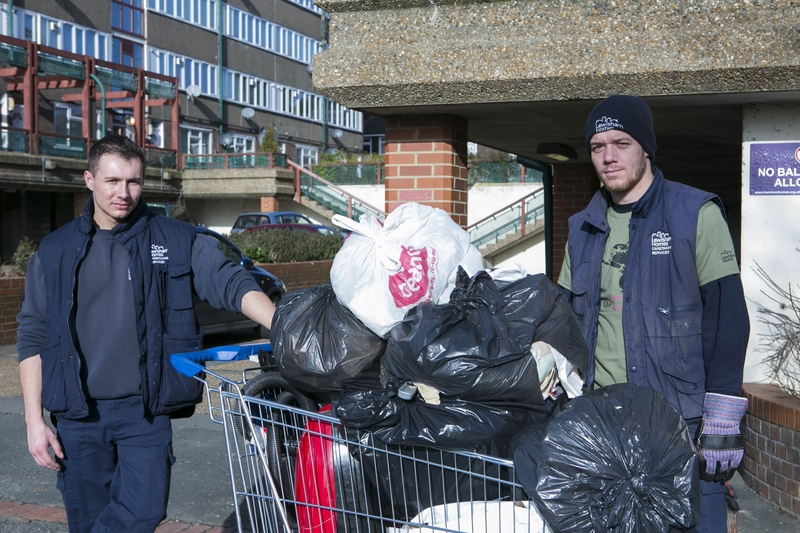 At the time Lewisham Homes staff were doing a spring clean of the estate. Maria Halouva from Lewisham Homes has the story. Lewisham Homes have just finished a Spring Clean pilot event on Hatfield Close and Hazel Grove Estates last week. Staff have been on-site for two weeks giving the chute rooms a make-over, litter picking and talking to residents to bring lasting change. We’ll also have a skip at Hazel Grove and helping residents dispose of large items. Caretakers remove bags from chute area’s. Caretakers have been acid cleaning the chute rooms and deep-cleaning the chutes. We had a skip at Hazel Grove for the entire week, helping residents dispose of large items. Other staff members were busy litter picking and door-knocking to talk to residents about why there’s a rubbish problem and what can be done to bring lasting change. 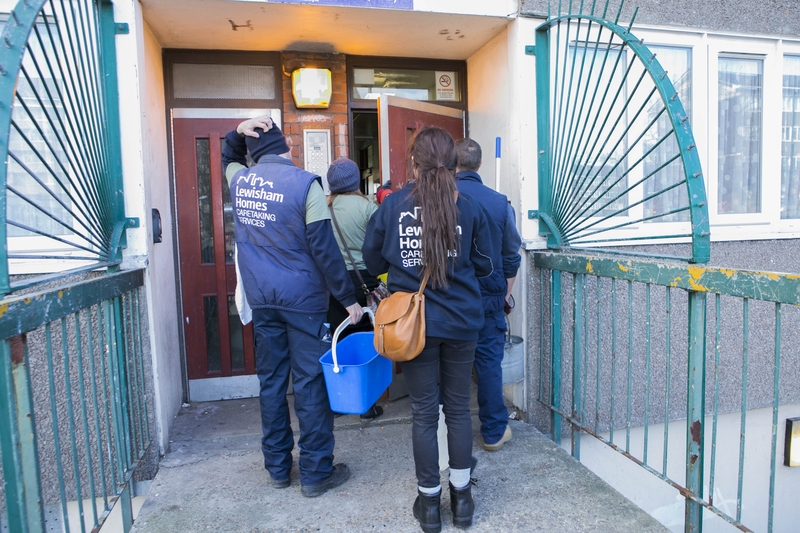 Residents were also asked how aware they were of the average time it takes caretakers to clean rubbish from chute rooms and other communal areas – keeping them from cleaning other areas of the estate. Lewisham Homes staff are ready for action. Spring clean week is a pilot programme that could be rolled out across the borough if it proves to be successful. Many residents stopped our staff during the weeks to say thanks and that they already felt prouder of where they lived. One resident said they couldn’t wait to show their block to their friends and they wanted to keep the communal areas clear of rubbish. We’ll keep you updated on the results of the programme in the following weeks. Categories: Environmental Campaigns, recycling | Tags: acid cleaning, Hatfield Close and Hazel Grove Estates, Hazel Grove gets a spring clean, Lewisham Homes, Maria Halouva, Spring clean for Lewisham Homes | Permalink.